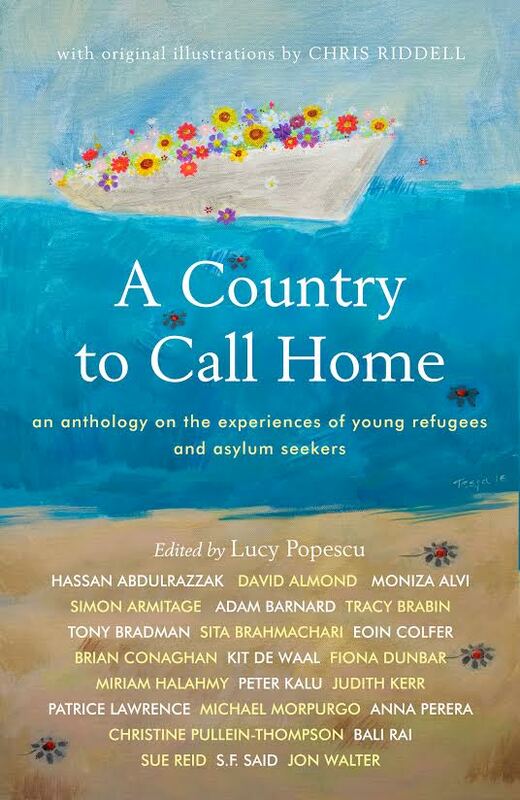 I was delighted last week to receive a copy of A Country to Call Home, an anthology of specially commissioned short stories, poems and flash fiction responding to the experiences of young refugees and asylum seekers. Edited, like its predecessor A Country of Refuge, by Lucy Popescu, it is published by the crowd-funding pioneers Unbound. The brilliant array of contributors includes Hassan Abdulrazzak, David Almond, Moniza Alvi, Simon Armitage, Adam Barnard, Tracy Brabin, Tony Bradman, Sita Brahmachari, Eoin Colfer, Brian Conaghan, Kit De Waal, Fiona Dunbar, Miriam Halahmy, Peter Kalu, Judith Kerr, Patrice Lawrence, Anna Perera, Christine Pullein-Thompson, Bali Rai, Sue Reid, S.F. Said, Jon Walter and Michael Morpurgo. The former Children’s Laureate Chris Riddell has provided haunting illustrations for every piece, while the beautiful painting that forms the cover is by Haymanot Tesfa. There are stories of home and of homesickness; about people trafficking and life in the refugee camps; about persecution and imprisonment; about prejudice, indifference and official inhumanity; and about the fortitude needed to survive these experiences. Written for Alan Kurdi, the Syrian Kurdish boy whose body, washed up on the shore of Turkey, momentarily aroused the conscience of many in the UK, Kit de Waal’s ‘Did You See Me?’ imagines the dreams, aspirations and day-to-day reality that preceded a life lost at sea. Simon Armitage’s darkly poetic reworking of the passage in Virgil’s Aeneid on the crossing of the Styx evokes the grim sea journeys undertaken by many refugees, while Michael Morpurgo’s ‘Locked Up’ chillingly depicts the gratuitous brutality of the UK’s immigration officers. Brian Conaghan’s poem ‘Just Another Someone’, with its parallel voices juxtaposing the experiences of refugees from Nazi Germany with those of today’s asylum seekers, reminds us that exile is not a new phenomenon. The comparison is reinforced by Popescu’s interview with Judith Kerr, the celebrated author of the Mog stories and When Hitler Stole Pink Rabbit, who came to this country as a child in the 1930s. Kerr’s recollection that ‘people were so kind to us during the war’ chimes with my own father’s experience, and makes one wonder what has happened to this country in the intervening decades. Aimed at both children and adult readers, this courageous book counters the negative stereotypes propagated by some politicians and sections of the press to demonise the most vulnerable people on the planet, which is why I am proud to have supported it. Instead, it challenges us to look, to see, and to recognise our common humanity. In his contribution to the anthology, S.F. Said, author of the best-selling children’s novel Varjak Paw, recalls his delight as a child reading Watership Down to discover that the mythical rabbit hero El-ahrairah had an Arabic name with which he could identify.